I am always on the lookout for new outfit ideas and inspiration for my work outfits. I need to make sure I look smart and presentable but when I’m on a job I need to also make sure I wear clothing that is easy to move in. I don’t like anything too heavy or structured or colours that get easily marked (white is definitely NOT an option!!). My thing at the moment is pairing a longer skirt with a jumper or t-shirt and of course you will rarely see me without a pair of trainers on! Unless I am at a posh event! I tend to struggle with putting tops and bottoms together and making outfits match mainly because I am just so indecisive. I find that having a few staple pieces of clothing in basic colours makes this dilemma easier to solve and means I can wear a loud print or a bold colour without looking too over the top because I am teaming it with something simple. 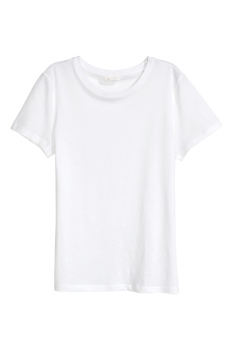 My favourite staple wardrobe pieces are t-shirts and jumpers in black, navy, white and grey. I read an article about Kate Moss and Sienna Millers style years ago and it said because they are Capricorns they go for basic colours. I am the same and also a capricorn. 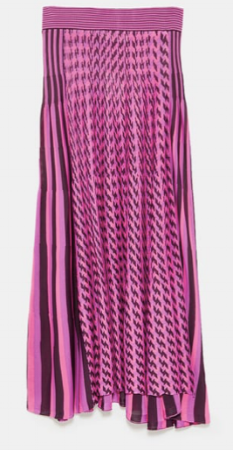 I love what they wear so it always sticks in my mind when I am stuck on whether to buy a fuscia pink number. It gets put back on the rails and I head for the black. More recently I have invested in a bit of colour, only for when theres no make up in sight though. 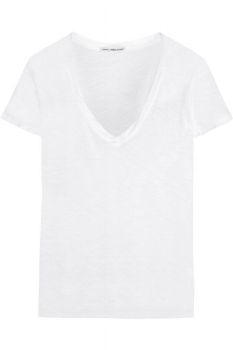 You can’t go wrong with a white t shirt, it really is the ultimate piece of clothing that everyone needs, it just goes with everything! You can dress it up or down and wear it in all seasons. 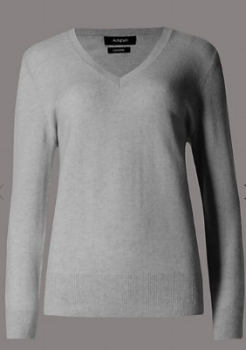 I also recently bought this grey cashmere jumper from M&S, it’s light enough to get away with in Summer and keeps you warm when it starts to get cold! The colour is really universal, it matches with anything and everything you pair it with. I’m a huge fan of skirts and I can’t help myself when I see any new shapes or prints. 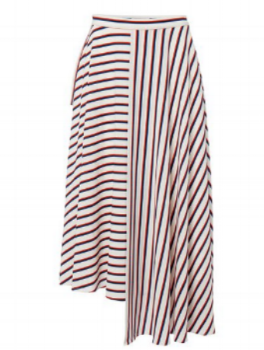 I recently bought this skirt from Markus Lupfer and it was what I would call an investment. I need to wear it loads to justify the spend but it was worth it, I had so many compliments! It’s great to be able to wear a quirky print like this and still look professional. I think it’s important to always look smart but in my job you can also look cool and I like my clothing to match my personality so its comfy classic with a modern edge and a trainer thrown in. You can never go wrong with a pair of trainers, they complete any outfit and they are super comfortable. I’m on my feet all day every day so for me it is vital that I’m never in any pain. I personally love black trainers, they do the job and look smart and chic, I have so many pairs and recently bought some Stan Smiths which looked great with the Markus Lupfer skirt! The best thing about wearing skirts like this is that you can easily alter your outfit from day to night. I'm often out after work at events and so I need a quick change and adding a cami and a heel completely changes the dynamics of the outfit from casual daytime to glamorous evening! I often find amazing pieces at H&M, Topshop and even Primark! I also love to bag a designer piece on Selfridges and on outlet sites like The Outnet (if you’re looking for a steal). One of my biggest shopping secrets is checking out stores the you would never normally shop in. I have found some gems in Next, M&S and Debenhams, stores that wouldn't necessarily be your go-to's for the latest trends but they really do have some gorgeous pieces! I recently bought this silk dress from the Preen X Debenhams collaboration and I just absolutely love it. The colour, texture and shape are all really complimentary and when I wore this I got so many compliments! I wouldn't have normally gone into Debenhams and I hadn't seen a lot of marketing for the collection so it really is worth popping into a store sometimes and seeing what they have to offer! Do you have any wardrobe staples you can’t live without? Let me know in the comments below!